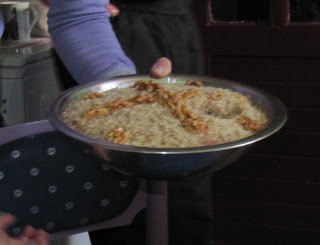 The Serbian cuisine, just like Serbian culture, implies not only region elements connected to Serbia, but other parts of former Yugoslavia as well. Great influences have been marked on the whole cooking process due to peasantry, which also influenced the folk craft, music and arts. Under the rule of the Ottoman Empire, during the last five centuries, Serbia has had not only cultural influences, but cooking ones as well. 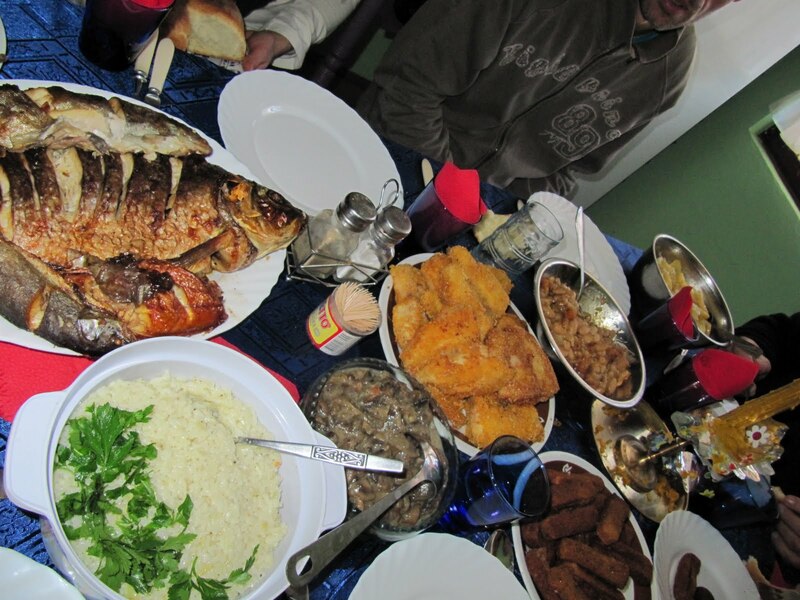 Special traditional dishes made in Serbia today have common roots with the dishes prepared in Turkey. The whole Serbian cuisine is derived from a mixture of influences coming from Mediterranean, especially Greek influences, Hungary, Turkish and Austrian cuisines. Kačamak: made from corn flour, I was told it's like polenta if you know what that is, I didn't. It's a bland breakfast dish that people top with ketchup, cheese, meat, ground hot pepper (as in jalapeno, not the spice) etc. Musaka: my favorite meat dish, minced beef mixed with eggs, onions, and spices, layered with sliced and seasoned potatoes, and baked. I just cooked this with my host mom today! Prebranac: my favorite Serbian dish, spiced and seasoned baked beans, they sound plain but they're delicious. Plus their served in the pots shown in this post which I love. Serbians are very prideful of their grilled meats and for good reason. Pljeskavica: a super popular dish, it's similar to a hamburger but it's grilled with spices and has a wider circumference than a hamburger, but it's just about 1/2 inch thick. At kafanas these are served plain traditionally, without a bun, but at street stands the bun envelopes the patty and you can top it with kajmak, ajvar, mayonnaise, onions, cucumbers, tomatoes, sour cream, or ketchup. Even I think pljeskavicas are really tasty, and I don't really care for hamburgers. The bun called lepinja is a Serbian flatbread. It's also wider than a hamburger bun to match the pljeskavica's shape and it's a lot more yummy than a typical bun. This flatbread is also what they serve at restaurants and when I first tried it it sort of reminded me of pita bread. Pljeskavica man! This is my favorite pljeskavica place and I've gone there enough that he knows me and asked me to take a picture of him to "remember [he] makes the best pljeskavica in the world"
Fish in Serbia mostly come from the Dunav (Danube in English) river. 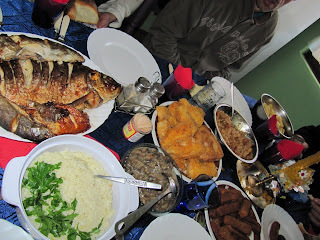 This is a meal from Sokobanja where a platter of four fish was presented with potatoes, rice and mushrooms, and french fries were on the side. In the top left there's a cream colored spread resting on leaves. It's delicious and it's called kajmak. My first meal: breaded chicken stuffed with pepper and cheese and spices. I distinctly remember feeling really cold, jetlagged, and confused that first night so I wasn't exactly a fan of this first meal, but since I have grown oh so fond of Srpska kuhinja (Serbian food, literally Serbian kitchen). Slatko: a fruit preserve, more sweet and liquidy than jam. 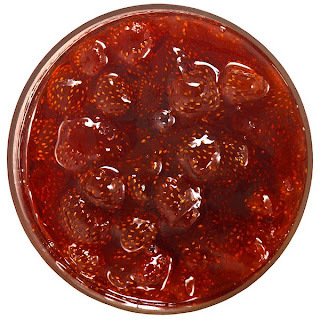 I've had strawberry, plum, blueberry, and cherry, It's traditional for honored guests to be greeted with a spoonful of slatko, literally meaning sweet. 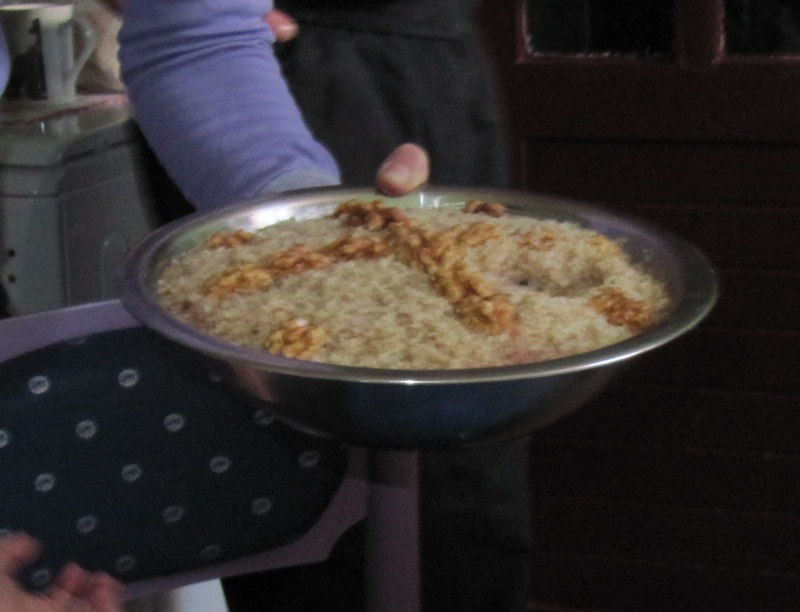 Koljivo made from wheat seeds, sugar, and walnuts, is served as you enter the host's house on their Slava or other special occasions. Each person gets a spoonful. Homemade pizzas, some things are universal. Perhaps these look usual but actually there's a layer of ham between a thin layer of tomato sauce and a layer of cheese. And this isn't how it's eaten either, people put ketchup or more tomato sauce on top before consumption. Full table view. It was my host sister's friend's birthday and we ordered a bunch and just shared it, choreographing the passing of trays as we went along. Usually at kafanas people order to share but often when it's just our group we order individually because we all have our favorites. I know this is a long and perhaps tedious post but I did the best I could to give an all-around understanding of Srbska kuhinja ~ Serbian kitchen/cooking. The food is really yummy and it will be missed!